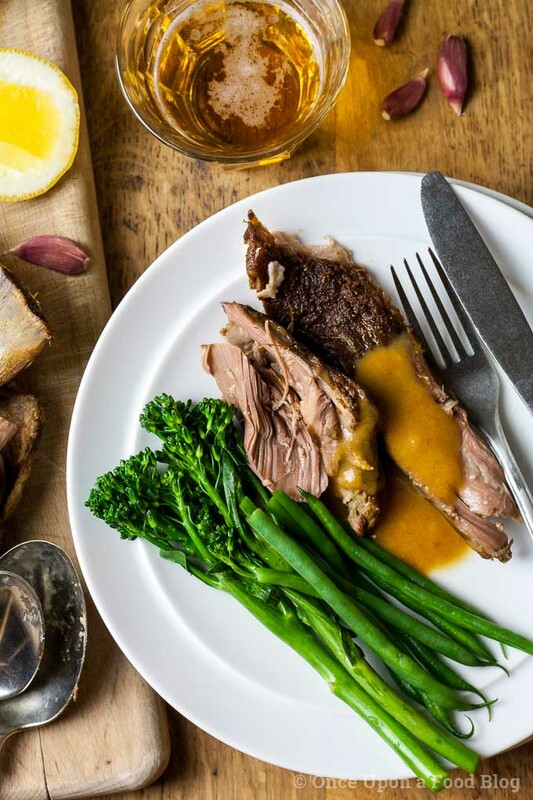 A fantastically easy recipe for a fragrant, full of flavour leg of lamb which even makes its own sauce. Perfect served with fluffy mashed potatoes and steamed veg. 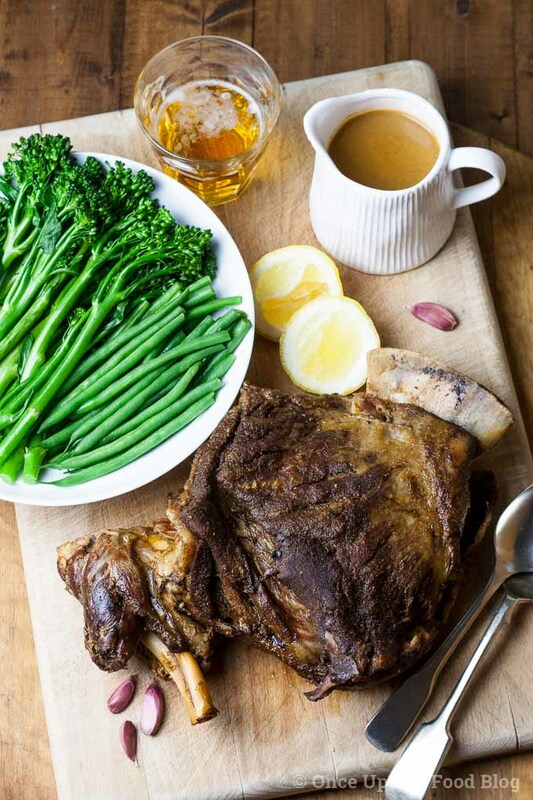 The recipe for this spiced Easter lamb comes direct from my biggest food hero – my dad. He has the ability to turn even the most basic of foods into a feast and make it look incredibly easy. Nothing is ever fussy or over the top and he often cooks vegetarian or vegan and makes it taste amazing (they seem to eat their body weight of vegetables most weeks). He does modern simple food really really well and going to stay with my parents is always a gourmet treat. Last year, between Christmas and New Year, Dad cooked this lamb for the whole family. All 17 of us. It was then that I decided to share this recipe with you. I’m a bit of a traditionalist when it comes to Easter food and usually serve lamb roasted with rosemary and garlic. 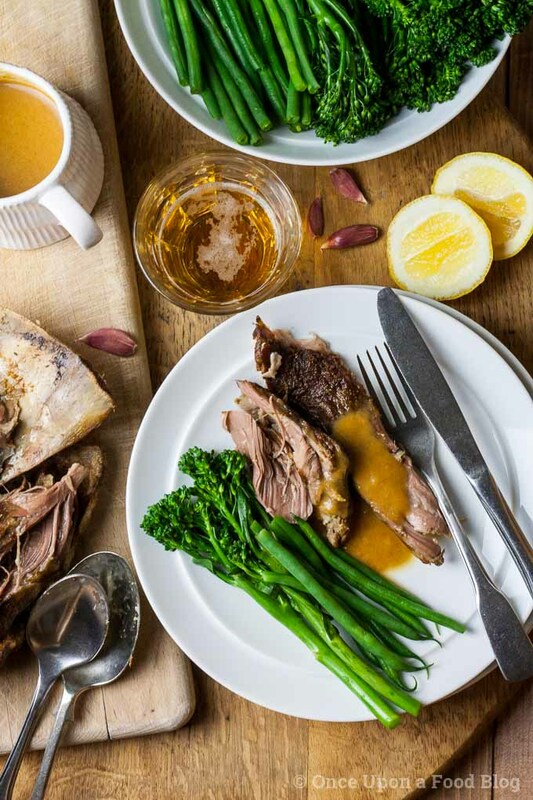 When you look at the list of ingredients for this spiced Easter lamb you might immediately think ‘curry’, which is far from being a British Easter classic, but don’t let the spices put you off. Think fragrant, full of flavour and deeply savoury, but not curry. My dad serves this with mashed potatoes and steamed veg and it works perfectly. I promise you, you will not miss the rosemary. 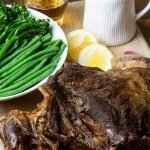 The ingredients list looks a little daunting but it’s all regular store cupboard stuff and this really is as easy as roasting a plain leg of lamb, but with so much more flavour. One problem I come up against if I do a leg of lamb in the slow cooker is that the leg is usually about 5cm too long for my pot. I get round this by taking it outside and hacking the end bit of bone off with an axe, often in my dressing gown at 8.00 in the morning – I’m not sure what the neighbours think! If you don’t fancy a bit of early morning al fresco butchering then you can either cook this in a nice big oven dish, or cook a shoulder of lamb instead. The shoulder works just as well as the leg, you can reduce the cooking time very slightly, by 30 – 60 minutes or so if you wish, but this is a very forgiving recipe so don’t get too hung up about it. It’s also worth me saying here that my slow cooker is a lovely new Breville (*affiliate link) one and it cooks much faster that my old one. The liquid round my lamb bubbles away rapidly for most of the cooking time. If your slow cooker is older you may well need to add two to three hours on to the cooking time. You know your own slow cooker so go with what you would normally do. I love that this recipe makes its own gravy. However, lamb is a fatty meat and you need to get rid of that fat from the cooking juices so that you don’t end up with a horribly greasy sauce. To do this you can either tip the roasting tin up a little at one side and spoon the fat off (which takes ages, I promise you) or you can use a gravy strainer to remove the fat. I use a gravy strainer. It’s loads quicker and easier and can also be used as a measuring jug so it’s actually quite a useful thing to have around. You can buy one here (*affiliate link). Once the sauce is separated from the fat I pour the fat into a disposable cup, leave it to set, then chuck the lot out. 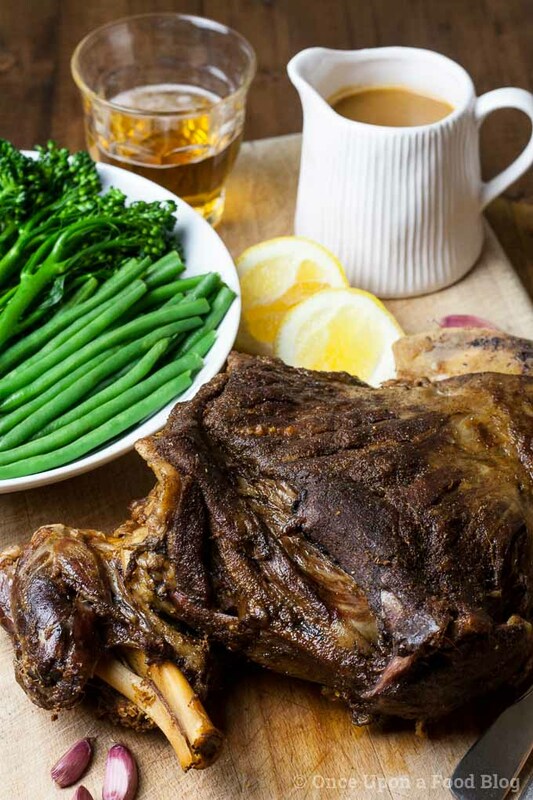 Stop press… It’s not hard to see that this is a shoulder of lamb, not a leg. The first photos I took were of a leg but I decided I wasn’t happy with them. So it was off to the supermarket to buy more lamb and they only had a shoulder. These photos are not perfect, but they are better, and we can’t face eating any more lamb so they will have to do! Mix everything from the cumin to the black pepper together in a bowl including one teaspoon of the salt. Rub the resulting paste all over the lamb ensuring it is evenly covered. If marinating, place in an oven dish, cover, and place in the fridge overnight. Bring the lamb to room temperature*. Peel the onions and cut into eighths. Peel the carrots and cut into quarters. Turn the slow cooker on to auto. Put the lamb into the slow cooker, add the onions and carrots and pour in the hot stock taking care not to wash the spice mix off the lamb. Add the remaining teaspoon of salt to the stock. Put the lid on the slow cooker and cook on auto for 6 hours. After this time the lamb will be beautifully juicy and begin to fall apart when you touch it. Put the vegetables into a roasting tin, place the lamb on top and add the stock being careful not to wash the spice mix off the lamb. Add the remaining teaspoon of salt to the stock. Cover tightly with foil. Put the meat into the oven and turn the temperature down to 130°C (260°F). Cook for around 5 hours, checking occasionally to ensure that the sauce is not drying out (add more stock if necessary). The lamb is cooked when it is beautifully juicy and begins to fall apart when you touch it. Remove the lamb to a warm plate covering well with foil and lots of tea towels to keep it warm. Allow to rest. Add the stock to the vegetables and whizz using a stick blender. Pour the sauce into a pan and heat just before serving. Serve the lamb with a large spoon (you won’t need a knife), covering with a good glug of the sauce. **I use a gravy strainer as I mentioned above. I’m so glad you think it looks delicious – we served this on Easter Sunday and everyone loved it!